EXFO announced the expansion of the FTB/IQS-88100NGE Power Blazer integrated 10M-to-100G compact field modules to include 40 GE/100 GE multi-stream traffic generation and monitoring, OC-768/STM-256 and OTU3 (43G) using 40G Base-FR serial CFP and OTU4 (112G) testing capabilities. As carriers face ever increasing needs for bandwidth due to triple-play services, data centres and higher-bandwidth residential broadband connections, it is becoming vital to ensure that service-level agreements (SLAs) are met under normal and congested network conditions. EXFO’s new 40GE/100GE multi-stream traffic generation and monitoring provides the flexibility to configure up to 16 flows of traffic simultaneously with data, voice and video profiling, ramp and burst traffic shaping. This enables service providers to simulate 40G/100G real-life traffic and validate their networks’ ability to handle and prioritise services which are notoriously sensitive to packet jitter and packet loss. Furthermore, multi-stream traffic generation and monitoring provides per-flow quality of service (QoS) metrics including throughput, latency, frame loss, packet jitter and out-of-sequence in simplified test result views with visual gauges for network engineers to quickly validate the network’s key performance indicators. Failure to respect the QoS requirements of customer contracts often results in damage compensation by the service provider. Traffic generation and monitoring capability is offered on the FTB/IQS-88100NGE Power Blazer and FTB/IQS-85100G Packet Blazer modules. 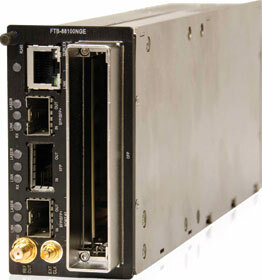 Furthermore, the FTB/IQS-88100NGE Power Blazer now supports OC-768/STM-256 and OTU3 (43G) optical rates and testing capabilities using 40G Base-FR serial CFP and OTU4 (112G) using 100G Base-LR4 and 100G Base-LR10 CFPs. Supported OC-768/STM-256, OTU3 and OTU4 bit error rate (BER) testing capabilities include per-channel power and frequency monitoring as well as delay and service disruption time measurements; key for 40G/100G SONET/SDH and OTN network commissioning and turn-up. The FTB-88100NGE Power Blazer is optimised for field testing with its 10M-to-100G testing capabilities on a single module. This is in addition to its easy-to-use GUI, flexibility, remote management, battery operation and integrated optical tools, as well as full compatibility with EXFO’s cloud-based test equipment and data management services.